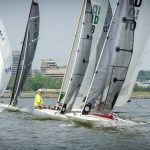 Joe Ewing from Indian Lake, Ohio won all six races during two fantastic days of sailing on the Potomac River. Indian Lake compatriots Brook Patten and Jeff Patten finished second and third overall. Eight boats sailed the race, that opened April 29 in a humble southwest breeze that gained voice rapidly, topping out at a steady 15 knots. Two boats were knocked down by strong gusts measuring20 knots at adjacent Reagan National Airport. The swimmers were Jeff Patten’s 20 Something and the Potomac’s Tim Dickson. 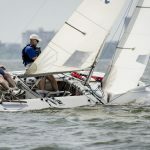 Sunday was lighter, reaching only 10 knots from the northeast, but with some sharp shifts to the east that pushed over Firewater, with Rick Loheed of St. Mary’s at the helm. 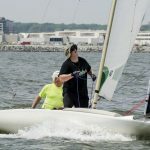 Ewing, who won the Cherry Blossom in 2016, praised the Potomac fleet for showing more speed around the course. Despite lopsided results, the local skippers seemed to appreciate all the information that was shared by the victors, as well as the opportunity to get better in the strings. Some crew were racing for the first time. “Jack-thanks very much for letting me crew on Sunday. It was a great intro to sailing the I-20, and we didn’t capsize- a measure of success. Really appreciate the opportunity,” is how the Potomac’s Ed Ryan thanked his skipper, Jack Sheehan. Rick Loheed’s crew, Tom Harrop, drove down from Rhode Island for the race. Tom has one of the older M20s in existence, Hull 32, but he needs parts for the boat. The Potomac’s Stew Harris had a pair of old style license plate rudders to contribute to Tom’s project. Harrop got some special attention before the race from Joe Ewing. 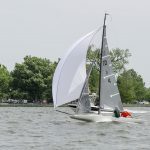 “Joe Ewing was very gracious in showing me responsibilities of a scow “crew” and creatively simulating wind conditions to allow spinnaker practice with a boat on its trailer in the parking lot,” said Harrop. “Thank you also for pairing me with Rick (Loheed). Despite the thrill of the chase while racing, he provided a tremendous amount of information. 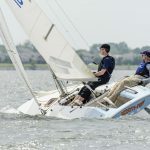 Although disappointing to have equipment issues and a capsize hinder our participation on Sunday, it was an invaluable lesson for me to go through the process of righting the vessel,” he continued. Loheed was sailing the 1985 Johnson known as Firewater, one of two new conversions to hit the Potomac this year. At one point, a shroud pin popped off, but they managed to jam a Leatherman into the Stamaster to keep the rig up. “Our racing could have been better, but hilarious comedic calamity intervened… Tom was great, a very nice guy & we are both lucky he was a MacGuyver type,” said Loheed. 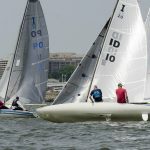 Top Potomac Sailor Jack Sheehan was racing his converted 1987 M20 Johnson for only the second time. The story of this conversion, which Jack dubbed “Scooty Puff,” illustrates the community spirit that has helped build the Potomac Fleet. The boat was first spotted for sale four years ago at the Windy Crest Yacht Club in Oklahoma. The owner was not ready to sell to an out-of-towner. It changed hands several times, but never really raced. Sheehan was lucky enough to have his lowball bid of $500 accepted last fall. It was a transportation relay to get the boat to Washington DC, starting with Jeff Patten of Indian Lake, who towed the boat and shaky trailer to Ohio on his way home from business in Texas. The final leg to Washington was an overnight trip by Jack Sheehan. A nice Quantum jib was a donated by Brook Patten of Indian Lake. The boat was fitted with a sprit and hood cover by the conversion team at Scowsailing.com. And, the bright red A-spin was a purchase from Willie Crear of Minnesota, another I-20 sailor who has been helping the Potomac fleet. 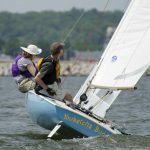 Special thanks go to Carl Schaefer, who originated the regatta last year and shot photos of the race this year. Virginia Bush and Trip Hook put together refreshments for the picnic on Saturday. Jack Sheehan was kind enough to score the event. And, a very special thanks to Lightning Fleet 50 which manned race committee, led by Aaron Bossenecker. Previous PostRace Committee is Fun!Next PostW.E.S.T Epoxy M Scow-SOLD! Scooty-Puff also went over on Saturday. Jason, my crew for Saturday, wasted no time getting on the board and righting the boat to keep us in the race. 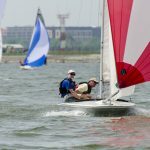 Lesson learned: Don’t capsize on the last tack of the last race of the day. There’s an award for that at Nationals Jack, known as the Willie-Crear-Scuba-Gear, so it’s not always a bad thing! Great fun both days! Currently still burned to a crisp and aching in muscles I did not know I have, but excited to get out on the water again soon. Thanks to the Ohio guys for making the long trek and to everyone for a super weekend!! Thanks to all the out-of-towners for coming. It is the community spirit that keeps me in the scow fleet. Many thanks to Joe and Jeff for all the help with advice and parts (new vang!). My only regret from the weekend is that I couldn’t squeeze out more time on the water. Sorry to have missed it. I was out of the country. Next year it will be on my list of regattas to hit. Hope to see all of you at either Indian Lake or Wawasee for this summer’s regattas.